I had not visited my local outdoor range since November. The rules at the club are increasingly restrictive, and often unwritten. I've found I'm more comfortable shooting elsewhere — despite the close proximity to my home. However, I had Friday off and with only a short time window for "play," I decided to take a chance on hitting the range in the morning. 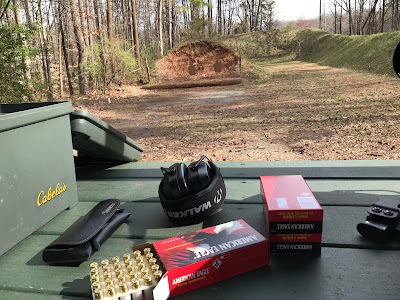 I was somewhat surprised to have the ranges to myself, despite it being a warm 70° outside. Perhaps others are taking the same dim view of the ever-changing ruleset. My plan was to set up two targets and practice my transitions; we're permitted the use of two targets if only one shot is made on each target. (Alternatively, two shots on one target is permitted.) I was only able to run that drill for a few strings before strong a breeze come up, the start of a cold front approaching. The hanging targets starting blowing back and forth. Fortunately I had also packed a target stand, alas just one, so was able to continue my session on a single target, which only blew over a few times. As I have been doing of late, I ran through several magazines while holding my flashlight, in preparation for an upcoming match. However, most of the time was spent shooting from the 15 and 25 yard lines. Since we're forced to shoot slow, I might as well make the best of it. At one point while shooting my "pairs," I called a shot bad, and out of habit fired that now verboten third shot. I found myself looking over my shoulder a lot after that, as the range officer has a habit of sneaking up behind you before beginning his admonishments. Despite waiting to be chastised, the warm spring morning made for a pleasant outing. As an added treat, I found a loaded magazine left in my bag from a previous range trip, so I got in a bonus round of shooting! It was certainly a pleasure to shoot in a t-shirt after so many months of cold weather. I could invision your morning!! Would have been more Peaceful had you not had the lurking feelings of the "Gestapo" behind you!!! They always screw up a "Nice day!!" They should be careful!!..... You are shooting "Live" ammo with a semi-automatic pistol..... "He" could easily be mistaken for a "Terrorist!!" PS Funny you should mention that!! Got some "Range Time" in today at my local Indoor Range!! Met some nice troops sharing the adjacent lane!! 'Always good to meet other "Gunnies!!!" Our Range Master is a "Neat Guy!!" Very Helpful, informative and "My Good Friend!!" "Shoot the place up...'BUT' BE SAFE!!' Col Jeff's 4 basic rules are forefront!! Always remember,"Safe Shooting is No Accident!!" "I don't know what you were doing, but it's against the rules." We've also been admonished for firing a shot at the same time that somebody else in the range fired a shot, and found out it's a new rule that would be announced "next week." I could do a series on the absurdities we've faced. At the indoor range, the SO says simply, "Have fun."